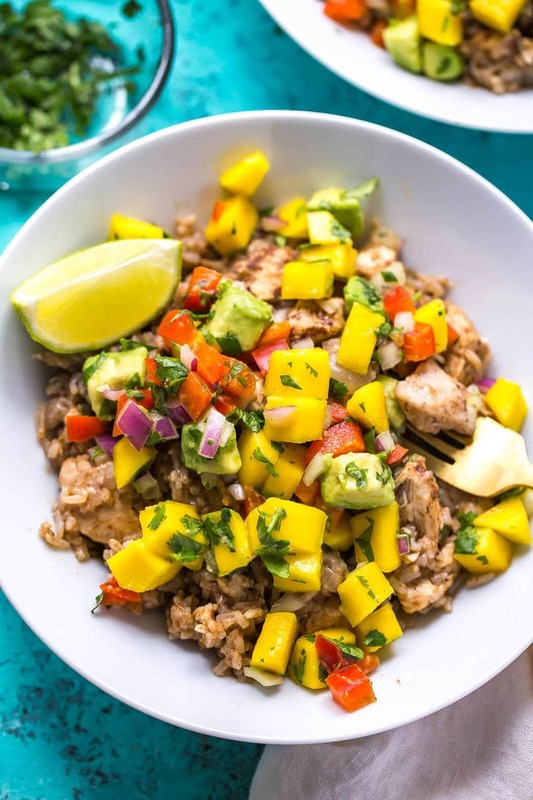 This Instant Pot Jerk Chicken and Mango Salsa is a one pot meal made complete with homemade jerk chicken seasoning using ingredients from your spice drawer along with basmati rice – works well for a make-ahead lunch or as a 30-minute dinner idea! Have you ever wanted to learn how to make jerk chicken? Well, now's your chance to make a copycat version at home! 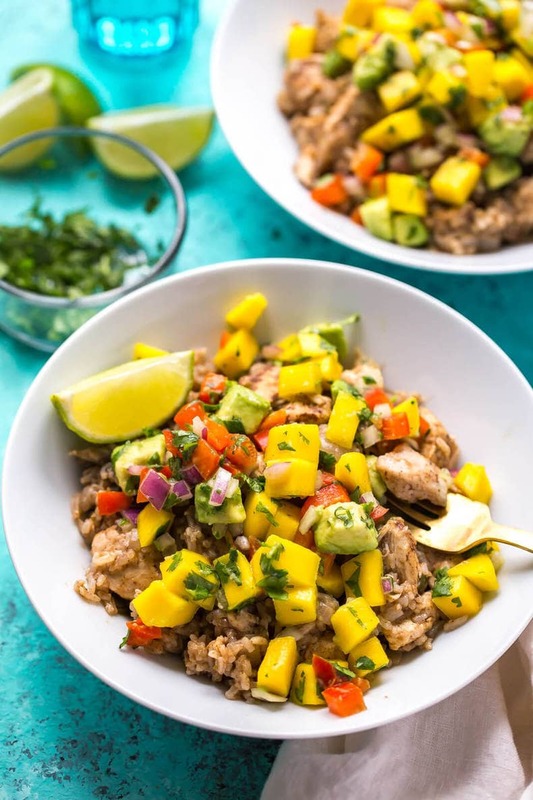 This Instant Pot Jerk Chicken and Mango Salsa is a delicious one pot meal that takes the guess work out of your favourite Caribbean dish and most of the spices are ones you can find in your pantry at home! And I mean, anytime you add mango salsa to the mix along with some avocado…let's just say you can't go wrong! I think I've made this mango salsa maybe 3 or 4 times now on the blog, it's just so good! 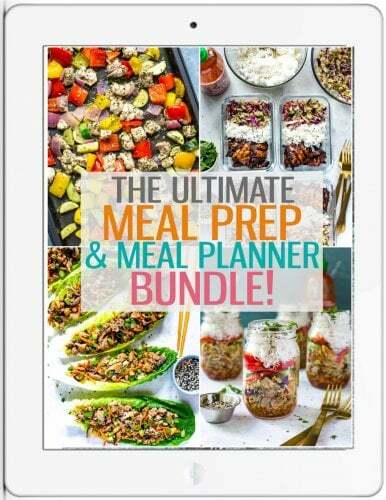 So bring the flavours of the tropics to dinner tonight, or your weekly meal prep! I don't know about you, but one or my fave things to do to make meal prep a bit easier is to make some homemade spice blends and keep them on hand. I have a homemade taco seasoning, Italian seasoning, alongside a Greek spice blend and Cajun mix. I sometimes buy the store brand spice blends when they require special ingredients I don't necessarily want to source out like Za'atar spice (mostly used in Mediterranean cuisine), but as it turns out, jerk chicken seasoning is way easier to make than you think! 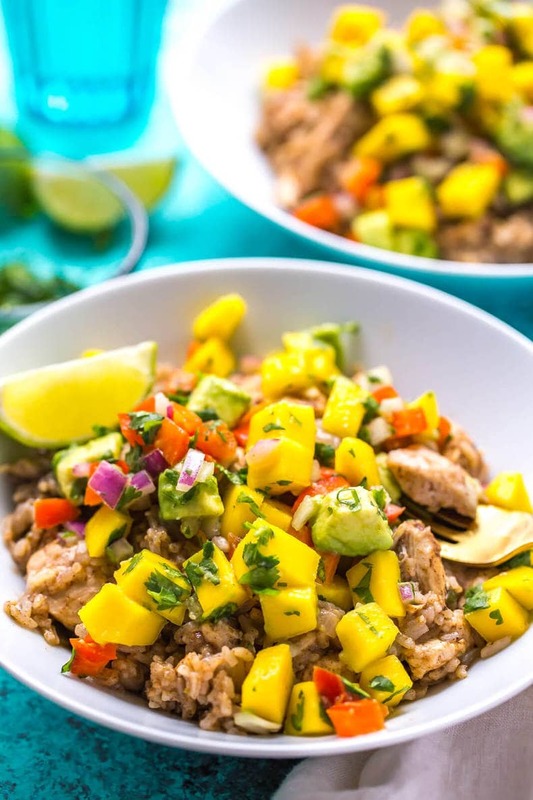 So, what can I tell you about these Instant Pot Jerk Chicken and Mango Salsa bowls other than the fact that they are delicious and make a super healthy dinner. Let me fill you in on the spice blend first though. With this jerk chicken recipe, I don't really use too much cayenne pepper and instead rely on some jalapeno peppers to bring some heat to this dish. I de-seed most of them and chop them up really fine so the overall dish isn't too spicy, and then I also add in some other ingredients like lime juice, garlic and onions to finish the flavour and create somewhat of a marinade/sauce for the chicken and rice. And speaking of rice, I've cooked it at the same time as the chicken with all of the seasonings to make this a true Instant Pot dump dinner. That's the best part of the Instant Pot: the fact that you don't have to go through a bunch of steps. Just dump everything in, set it and forget it. I would be doing it wrong if I were to cook the rice on the side separately. Plus, while it's not necessarily authentic Jamaican jerk chicken, it is an easy version that also packs the rice with a ton of flavour. Sooooo good. 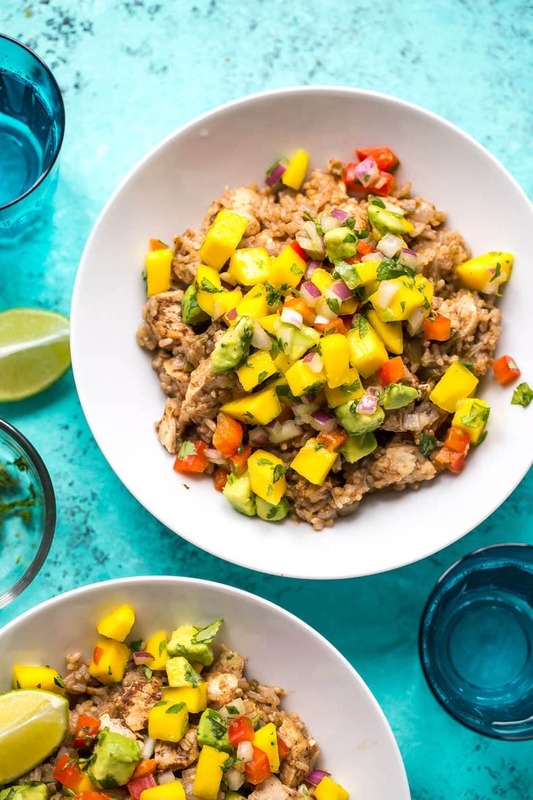 The mango salsa is kind of optional for this recipe but it does bring a nice touch to these bowls, and a pop of colour, especially if you end up using avocado. 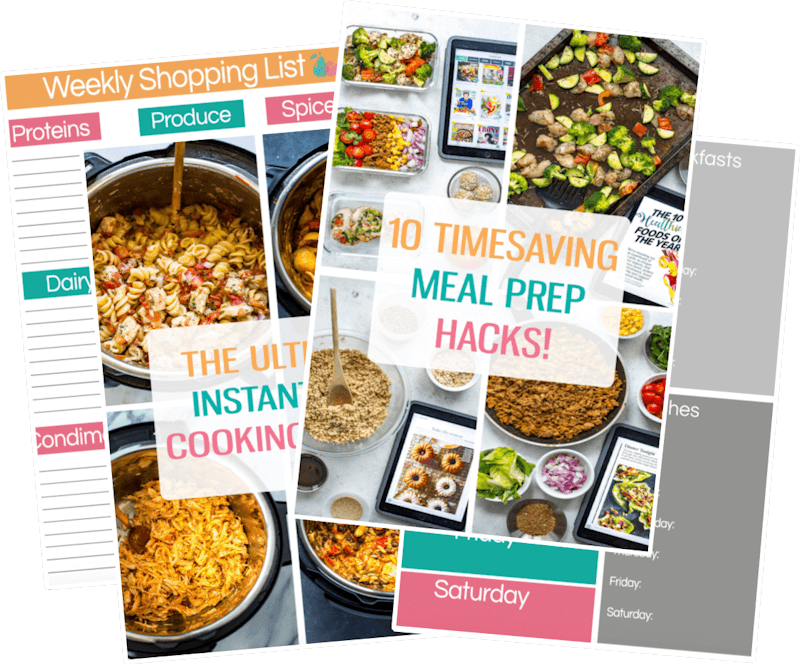 But, if you're not into making the salsa while everything's cooking away in the Instant Pot, you can definitely use up other veggies in these bowls, like what I did with these Jerk Chicken Meal Prep bowls that I created last year. I would suggest adding in some thinly sliced/chopped red pepper and some sort of green veggie like spinach in at the end of cooking time and let it all sit for 5 minutes with the lid on. 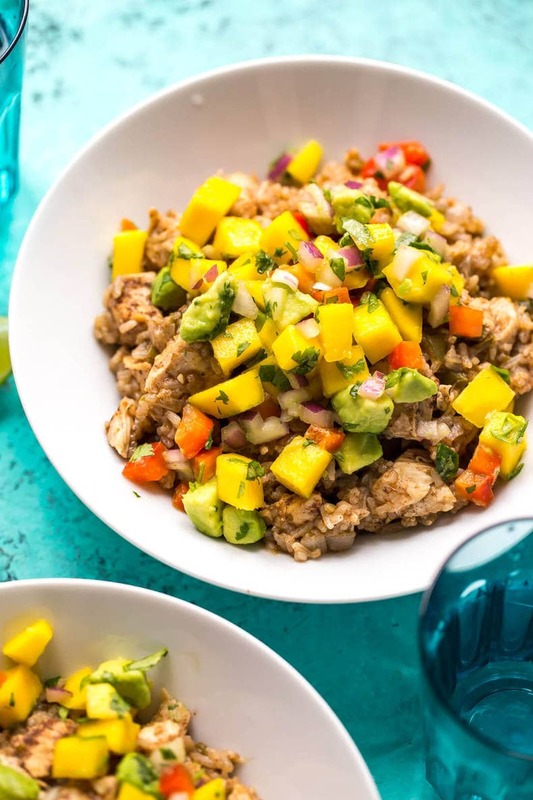 That way you get your veggies in, and this Instant Pot Jerk Chicken is more microwave-friendly if you go to take these bowls as a work lunch. 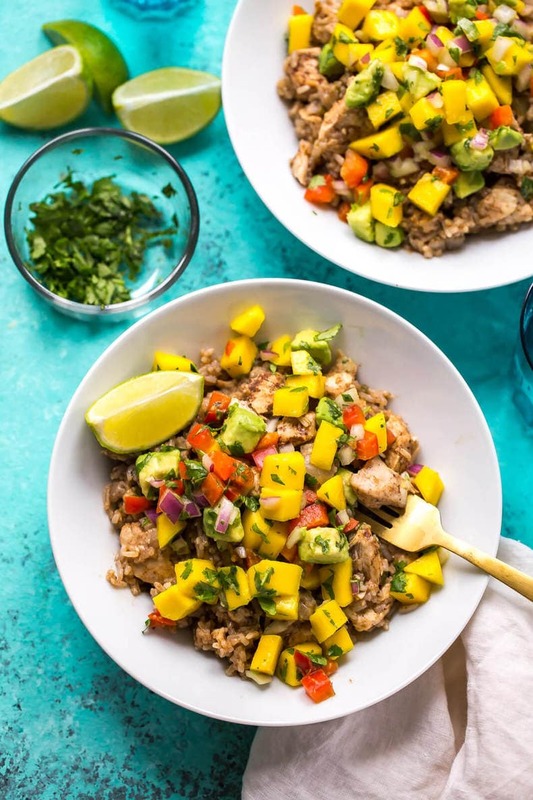 Will you be making this Instant Pot Jerk Chicken and Mango Salsa? 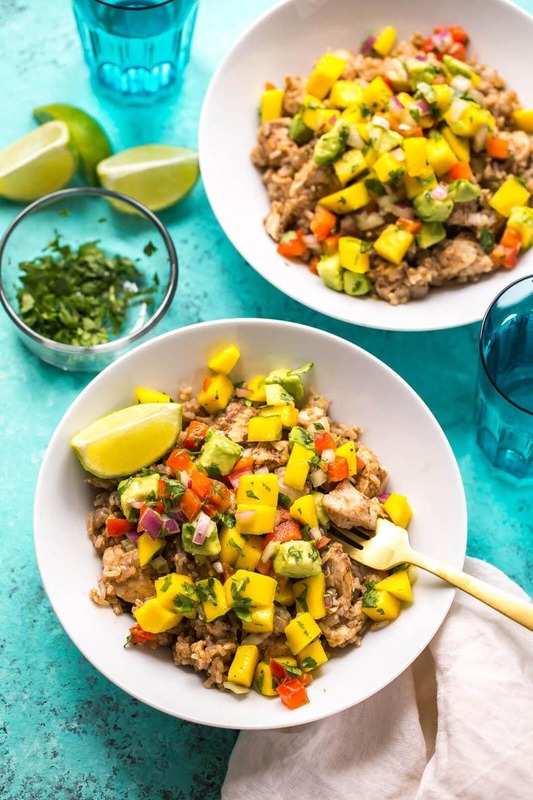 When meal prep is this easy and delicious, you're going to want to make more of these bowls and celebrate the warm weather with some heat! You could use this Jerk Seasoning if you don't feel like making your own! 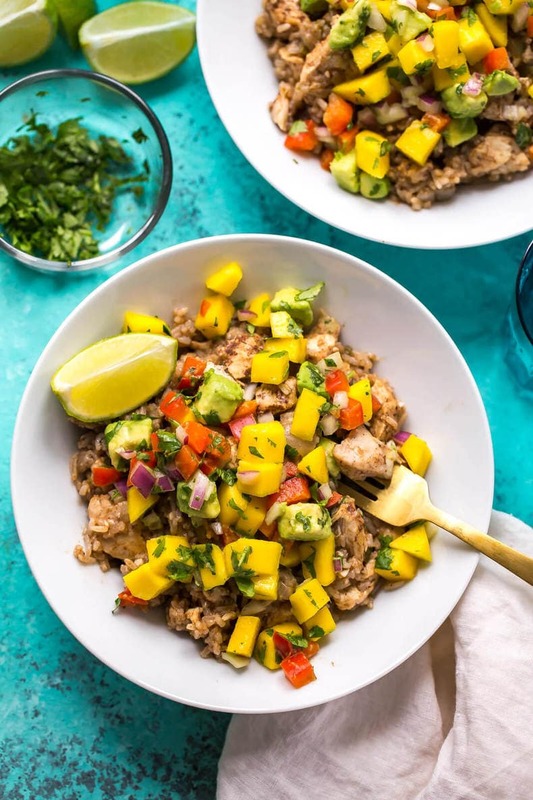 This Instant Pot Jerk Chicken and Mango Salsa is a one pot meal made complete with homemade jerk chicken seasoning using ingredients from your spice drawer along with basmati rice - works well for a make-ahead lunch or as a 30-minute dinner idea! 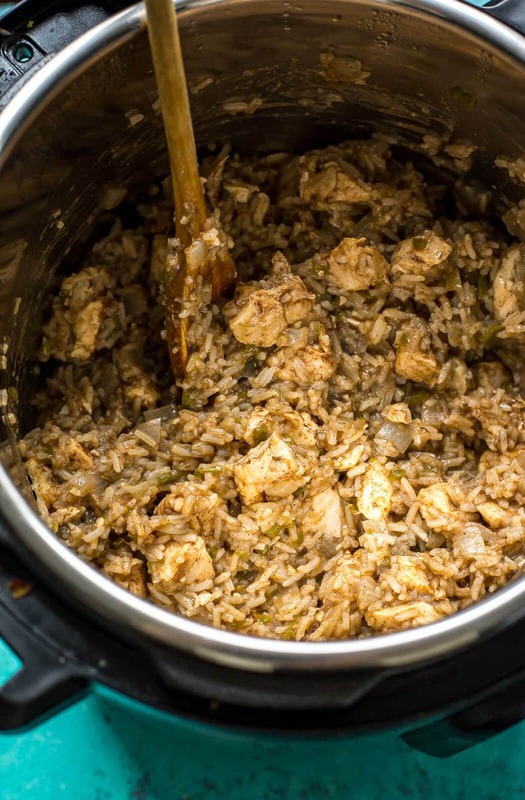 Add all ingredients to Instant Pot in order shown, leaving rice last and poured overtop of other ingredients as shown in the video. Cook on high pressure for 3 minutes. Instant Pot will take about 10-15 minutes to preheat, then the 3 minutes on high pressure. Meanwhile, mix ingredients for mango salsa together. Do a quick release of the pressure and open lid when safe to do so. 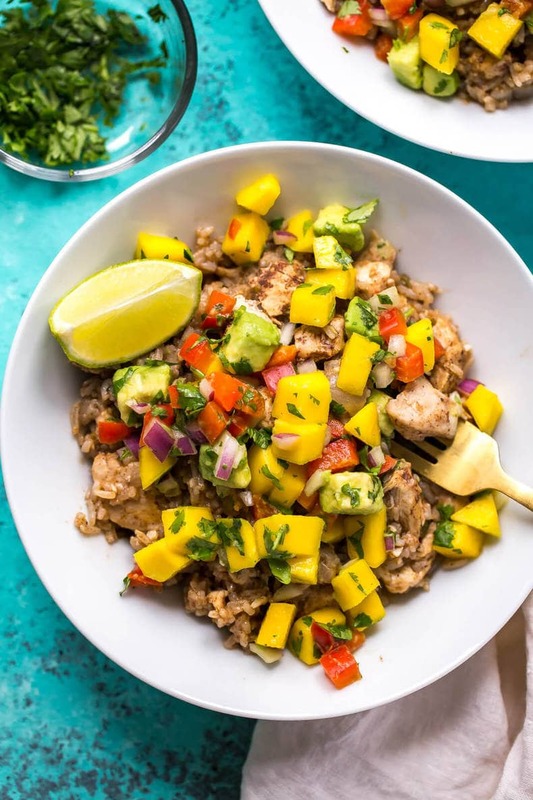 Stir together, then divide among four bowls and top with mango salsa. Serve and enjoy! 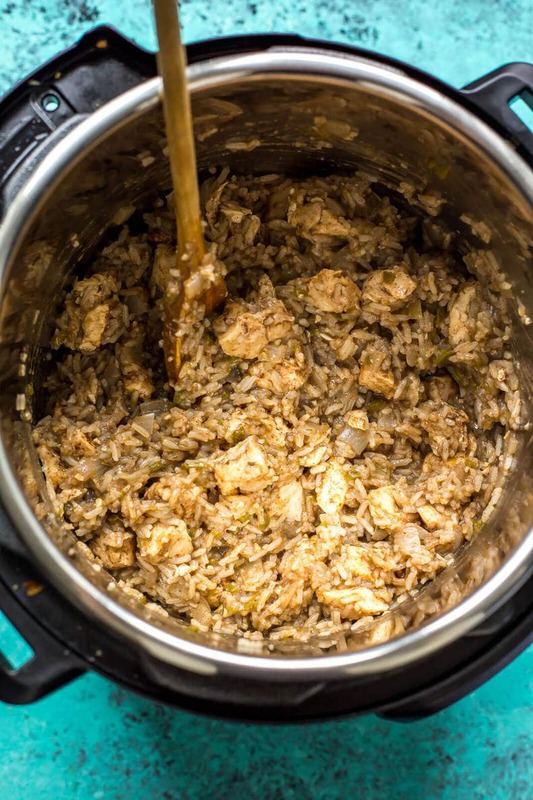 Note: I recommend you make the jerk chicken seasoning a couple of days ahead so you can easily access it and add it to the Instant Pot when you go to make the recipe. Then it will be in the pantry for future use! I’m thrilled to find a salsa without tomato! I’ve been missing salsa since I learned that the nightshades don’t agree with me. I’ll have to leave the pepper out of this one too, but I’m sure it will still be great! I just made this and it is too watery :(. I have put it for another 3 minutes. Too bad as most of your recipes are bang on for me. Ok so I put it back for 3 more minutes and then let it npr. Also I had to run out so left it covered. It’s good!!! A bit spicy as I put too much jerk, but it’s a keeper! More instant pot recipes please! Thanks for replying! Actually I used brown basmati, so totally my “fault”. Ah yes any sort of brown rice is definitely going to take longer to cook! But if you were able to get it to cook in 6 minutes on high pressure I would recommend doing that going forward! Or you could also try letting it natural pressure release (will take 20 minutes or more compared to the couple minutes for quick release). I’ve heard meat and poultry are kept more tender that way too! I am planning to make this this week. So, just to clarify, I put the chicken in raw and the rice in uncooked and it will all cook in only three minutes? And I don’t need to make sure the rice is covered in liquid? This seems too good to be true!! Thanks in advance! I’m planning to make this this weekend. It sounds amazing!